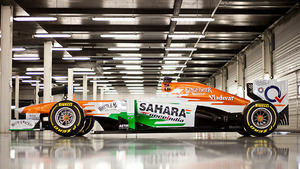 Without a teammate in sight, Paul di Resta was left to unveil the brand new Force India car alone, as the team launched their 2013 chassis at Silverstone today. The VJM06 added to the number of cars that have added the modesty panel, although question marks remain over whether they will still be there by the time we get to Australia. Di Resta took the car out for a quick spin to make sure everything was in place, although the British driver explained that he's really keen to compare the car to others. Seeing the car built and complete for the first time is a special feeling. I’ve followed its progress in the tunnel and it looks very impressive - aggressive and fast. Now I’m just eager to get out there and see where we stand compared to our competitors. Although Di Resta was the sole driver representative at the team, the speculation over Jules Bianchi getting the gig is growing. Force India have said they wanted to keep him in the reserve driver role for another season, which hints at his appointment in a different seat. However, they've also said they won't confirm the second driver before the Barcelona test, so there's still a while to wait yet. Technical Director Andrew Green took a different approach to the stepped nose than we heard from Lotus earlier this week. He explained that there wasn't a lot to lose in terms of time, but a lot to gain in terms of looks. It’s a brand new car from the ground-up – everything is new... 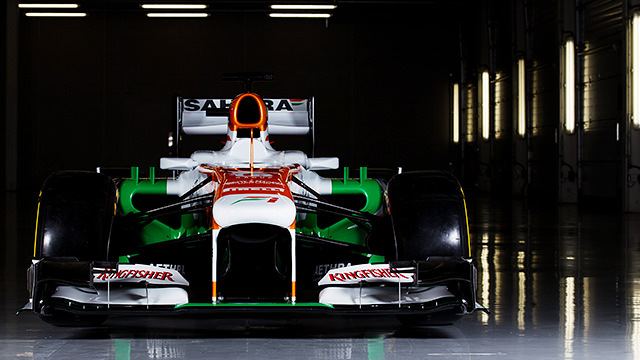 The biggest change that everybody is going to notice this year is the fairing on top of the nose to hide the 'step'. It’s neutral as far as the car’s performance is concerned but tidies up the flow over the top of the chassis. As well as launching the new car, the team also announced deals with TW Steel, who are set to become the official timing partner on a multi-year deal, and Chatham Marine who become the team's official shoe supplier. If only they could confirm a driver as well, then we'd all be happy.